Figure 1: ALMA detection of SiO line polarization in the HH 211 jet. (Top) A composite image showing the HH 211 jet and the outflow around it. 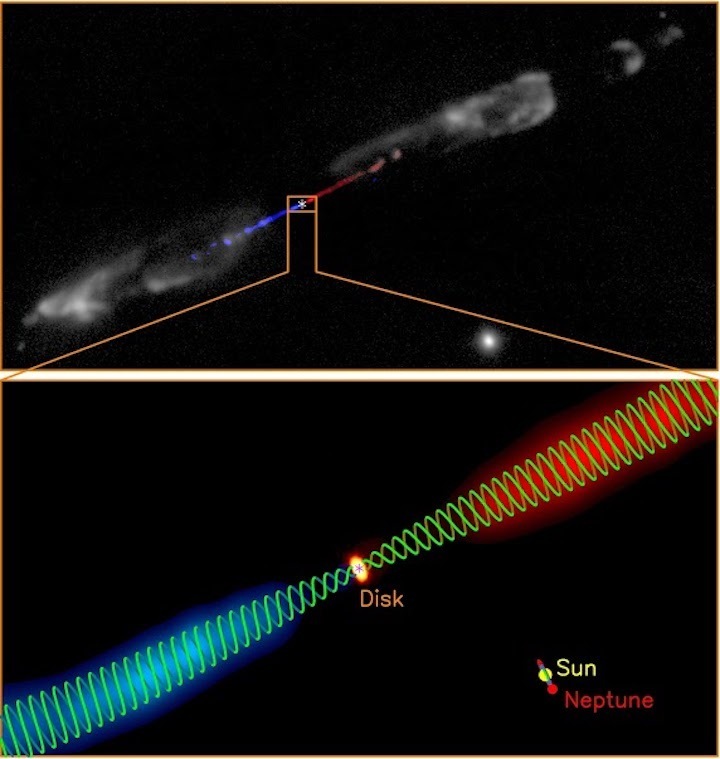 The blue and red images show respectively the approaching (blueshifted) side and the receding (redshifted) side of the jet in SiO (adopted from Lee et al. 2009). Gray image shows the outflow in H2 (adopted from Hirano et al. 2006). (Bottom) A zoom-in to the innermost part of the jet within 700 au of the central protostar. Orange image shows the accretion disk recently detected with ALMA (Lee et al. 2018). Blue and red images show the blueshifted and redshifted sides of the innermost jet coming out from the disk, obtained in our observation. Yellow line segments show the orientations of the SiO line polarization in the jet. A size scale of our solar system is shown in the lower right corner for size comparison. In the two panels, asterisks mark the possible position of the central protostar. An international research team led by Chin-Fei Lee in the Academia Sinica Institute of Astronomy and Astrophysics (ASIAA) has made a breakthrough observation with the Atacama Large Millimeter/submillimeter Array (ALMA), confirming the presence of magnetic fields in a jet from a protostar (baby star). Jet is believed to play an important role in star formation, enabling the protostar to accrete mass from an accretion disk by carrying away angular momentum from the disk. It is highly supersonic and collimated, and predicted in theory to be launched and collimated by magnetic fields. The finding supports the theoretical prediction and confirms the role of the jet in star formation. 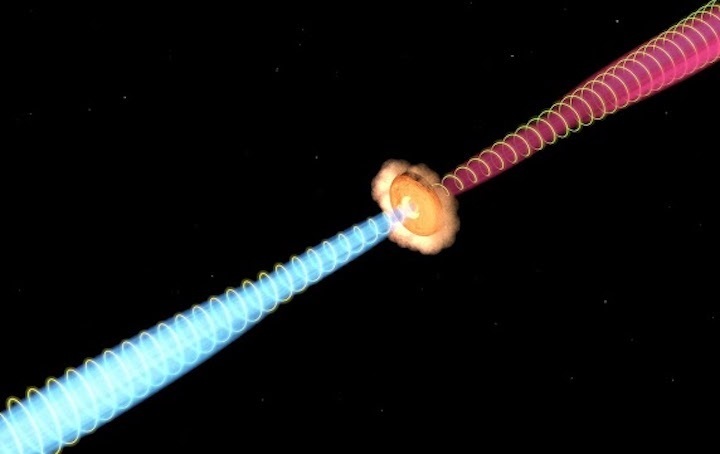 “Although it has been long predicted that protostellar jet is threaded with magnetic fields, no one is really sure about it. Thanks to the high-sensitivity of ALMA, we have finally confirmed the presence of magnetic fields in a protostellar jet with molecular line polarization detection. More interestingly, the magnetic fields in the jet could be helical, as seen in the jet from an active galactic nucleus (AGN). Perhaps, the same mechanism is at work to launch and collimate the jets from both protostar and AGN,” says Chin-Fei Lee at ASIAA. HH 211 is a well-defined jet from one of the youngest protostellar systems in Perseus at a distance of about 1,000 light-years. The central powering protostar has an age of only about 10,000 yrs (which is about 2 millionths of the age of our Sun) and a mass of about 0.05 solar mass. The jet is rich in SiO molecular gas and drives a spectacular molecular outflow around it (see the top panel in Figure 1). With ALMA, the team zoomed in to the innermost part of the jet within 700 au of the central protostar, where the emission is the brightest in SiO. They detected SiO line polarization toward the approaching (blueshifted) side of the jet (see the bottom panel in Figure 1). The polarization has a fraction of about 1.5% and an orientation roughly aligned with the jet axis. This line polarization is due to the Goldreich-Kylafis effect, confirming the presence of magnetic fields in the jet. The orientation of the magnetic fields could be either toroidal or poloidal. According to the current jet launching models, the magnetic fields are expected to be helical and should be mainly toroidal there where the polarization is detected, in order to collimate the jet. Deeper observations will be proposed to detect the line polarization in the receding (redshifted) side of the jet and check for consistent morphology of the polarization. In addition, additional SiO line will be observed in order to confirm the field morphology. The observation opens up an exciting possibility of directly detecting and characterizing magnetic fields in protostellar jets through high-resolution and high-sensitivity imaging with ALMA, which can improve the theories of jet formation and thus our understanding for the feeding process in the innermost region of star formation. Figure 2: Possible helical magnetic fields in the HH 211 jet. Blue and red images show the blueshifted and redshifted sides of the jet coming out from the disk, as shown in the bottom panel of Figure 1. The greenish helical lines show the possible magnetic field morphology in the jet. The asterisk marks the possible position of the central protostar. A size scale of our solar system is shown in the lower right corner for size comparison. Credit: ALMA (ESO/NAOJ/NRAO)/Lee et al. Image Credit: ALMA (ESO/NAOJ/NRAO)/Lee et al.